An Australian Spotted Gum solid floor - installed. Click here for pre-finished engineered. Species Info - "An Aussie Icon"
Spotted Gum - Corymbia maculata, Lemon-scented Gum, Corymbia citriodora, Eucalyptus citriodora - is a hardwood native to the east coast of Australia. It is a durable, strong wood. People are drawn to Spotted Gum flooring not only for its strength but also its quiet, up-market but muted brown colors, while at the same time valuing the visual interest that comes from its contrasting cream sapwood and pinkish tones. As a practical consideration, Spotted Gum has fire resistant properties making it an attractive choice for wildfire prone areas. Fabled "Fiddleback Grain": This gorgeous hardwood invites a closer look for another reason. Its cathedral grain is interspersed with occasional sections of wavy fiddle-back grain, adding subtle interest, as do gum veins. Spotted Gum with fabled "fiddleback" grain. ©. 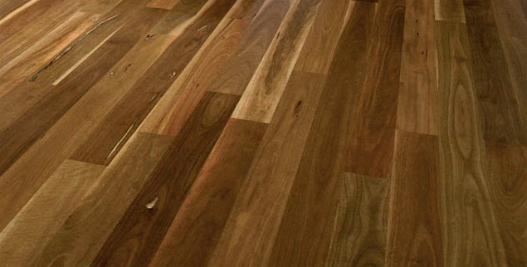 Uses: Spotted Gum is favored for flooring, structural, and decorative uses in home and commercial building. However, this quiet sophisticate knows how to roll up its sleeves for some heavy duty work. Due to its strength and marine borer resistant properties, Spotted Gum is also used in boat building, and wharf and bridge construction. It even found a role in the Australian mining industry as structural timbers. It is also the wood of choice for high impact uses such as axe handles. Janka hardness: 2473 (American White Oak is 1360). Australian Spotted Gum solid flooring - brown and cream colors, cathedral grain. ©. 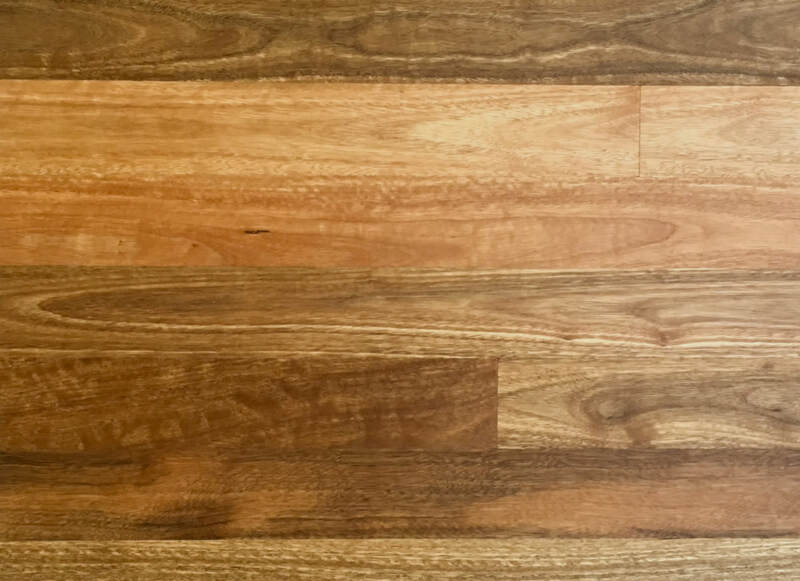 WHY is this particular Australian wood called "Spotted Gum"? INTERESTING FACT: The name of Australian Spotted Gum comes from the characteristic spotty patterns in the bark. ©.